There were several names that really caught my imagination when I first started reading about the First World War, and one was High Wood. I wanted to see these places and find out more about what happened there. The excellent aerial photograph shows the London Cemetery and Extension to the south-east of the wood. Interestingly, this photograph was taken by Mike Insall, whose grandfather, Jack Insall, took some of the black and white images (credited as A.J. Insall) from between the Wars that can also be seen on this website! There is a lot to see at High Wood and in the area surrounding it; so as well as this page covering High Wood, there is a second page which covers the area around High Wood. This includes sites that can be seen in the villages of Bazentin-le-Petit, Martinpuich and Longueval. There is an excellent account of the fighting in and around High Wood during July to September 1916 available; this is The Hell They Called High Wood by Terry Norman, and this book is highly recommended if you have more than a passing interest in the area. Much of the information here was sourced from that book, and its contribution is acknowledged. The real name of High Wood, as used before the War and as marked on French maps today, is Bois des Fourcaux – the word relating to pitchforks. However, during the First World War it was marked on some maps as Bois des Foureaux. High Wood is not large, but was of tremendous significance during the Battle of the Somme. The wood was first attacked on 14th July, 1916, but the British were unable to take it. An account of the various actions leading to the final assault with tanks on the 15th of September is given below. High Wood probably looks very similar in appearance today as it did before the Great War. It is possible to walk all the way around the edge of High Wood – the wood itself is private property however. Today, the area is sometimes used for shooting, and the bang of shotguns sometimes echoes as you walk around it. From the eastern corner of the Wood, a sunken track leads south-east in the direction of Longueval. This is Wood Lane, in front of which so many men died, under enfilade fire from the machine guns in High Wood. Today, the main danger comes from occasional off-road vehicles negotiating this track. But mainly, walking around High Wood today is a peaceful and pleasant experience, and in season the bluebells grow in a thick carpet within. It is almost impossible to imagine the human suffering, fighting and death that occurred here over a two month period nearly 90 years ago, whilst the British struggled desperately to advance their offensive on the Somme, and to take High Wood. 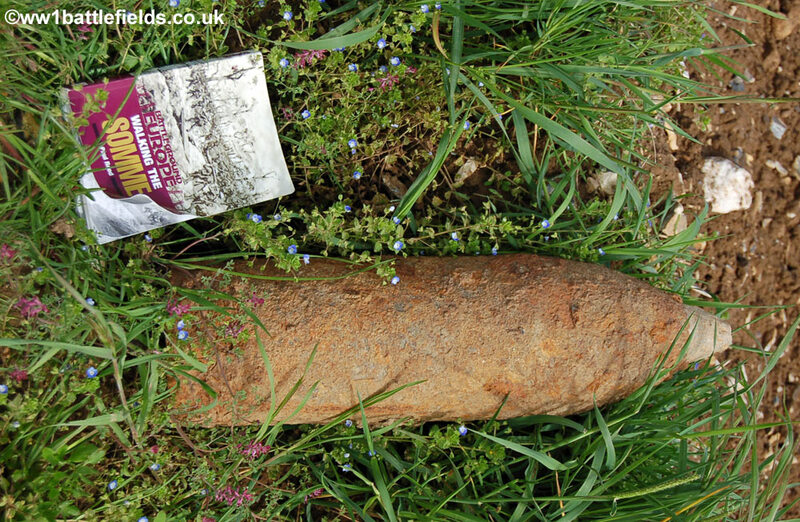 However, the area around the wood constantly shows reminders of the conflict – the ‘iron harvest’ of shrapnel and unexploded ordnance is common here – and is still dangerous even ninety years later. High Wood was the last of the major woods in the Somme offensive of 1916 to be captured by the British. The fighting in Mametz Wood was grim, and in Delville Wood it was hellish, but they eventually fell, as did Trones Wood. Despite a whole series of attacks spanning two months, High Wood held out until September the 15th, 1916. It was never fully cleared after the war, and it is estimated that the remains of around 8000 soldiers, British and German, still lie today in High Wood. Right opposite the wood is the London Cemetery and Extension. The beautifully maintained hedge behind this memorial is cut through with arches leading to the much larger Extension to the rear of the original cemetery. Similar arches can be seen in the brick-built entrance way through to the Extension. The Extension to the London Cemetery was added much later, and the cemetery extends across trench positions from 1916. The Serre Road No. 2 Cemetery was used to bury bodies recovered after the War, but by 1934 this was completed. Hence, the Extension here at London Cemetery was only started then, and used until 1939, and again after the end of the Second World War – for First World War burials, as bodies were still being recovered, and for 165 burials from the Second World War. 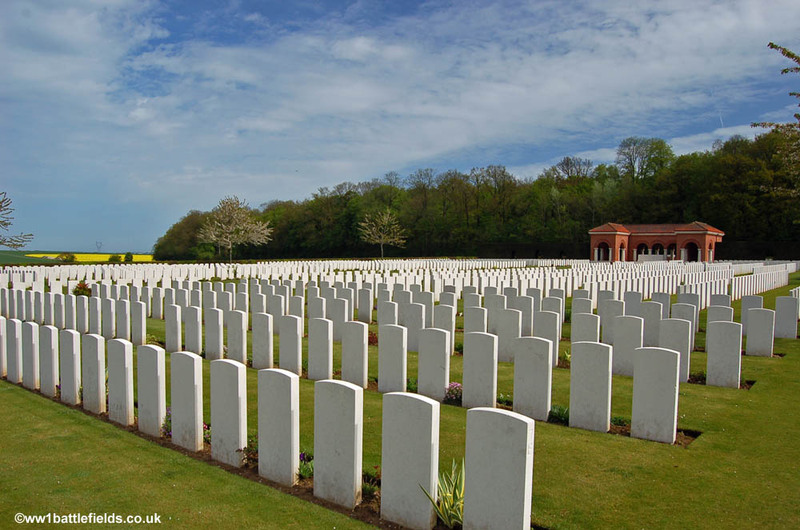 The First World War burials were of bodies recovered from across the Somme battlefields, and the sobering fact is that only 759 – less than 20% – of the 3,872 First World War burials are identified. In many cases however, the regiment is known, and in some cases the date of death to at least the nearest month is also shown on the headstone. On either side of the Cross of Sacrifice at the rear are semi-circles of graves, both First and Second World War. Four trees line either side of the cemetery, and large mature tress make a semi-circle towards the rear. The inscription at the base of Private Walter Lygoe’s grave reads simply “Dad Au Revoir”. Walter was from London, serving in the 8th Bedfordshire’s and was 31 when he was killed in action on the 19th of October 1916. It is perhaps not surprising, given that the 47th Division finally took High Wood that the most imposing memorial at the edge of High Wood is to that Division. 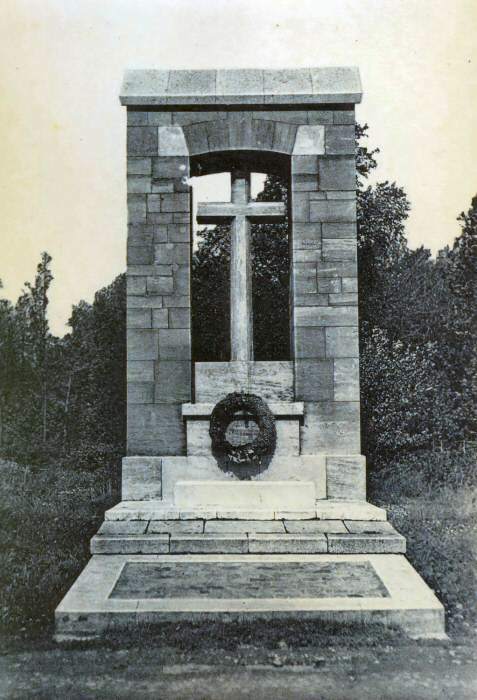 The original memorial was a wooden cross, which was erected in December 1916, but was taken back to London after the War. A more permanent memorial was dedicated in the 1920s (as was another memorial and a playground at Martinpuich village school nearby). You can see that there are differences between the two photos above – the memorial at High Wood had to be rebuilt due to problems with the foundations and was rededicated in 1996 – only the central cross (no longer surrounded by the arch) resembles the original. There are very smart posts in front of the memorial, the right one dated 1993 and the left dated 1996, from the City of London.The inscription on the front reads ‘To the glorious memory of the gallant Officers, NCO’s & Men of the 47th (London) Division who lost their lives in the capture of High Wood, Sept. 15 1916″. On the rear is the famous line from Rupert Brooke’s poem The Soldier: “If I should die, think only this of me: that there is some corner of a foreign field that is forever England”. 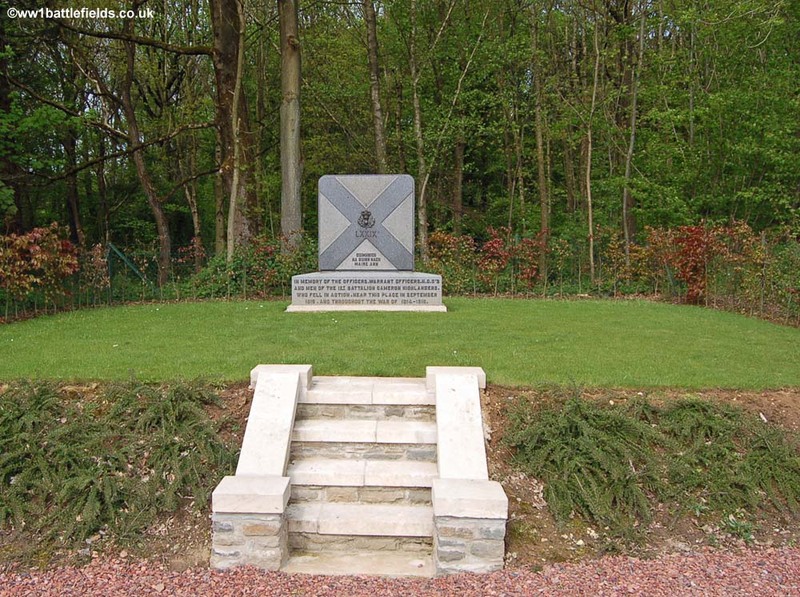 The second memorial to the Division at Martinpuich still stands and can be seen on the High Wood Area page. Below is a short history of the actions that took place around and in High Wood to try and capture this during the 1916 Somme offensives. On the 14th of July 1916, a dawn attack was launched on Longueval and other objectives. This was known as the Battle of Bazentin Ridge, and in the main was a success, gaining ground and taking the Germans by surprise. Towards the evening of that day, High Wood came into the reckoning. An attack was originally scheduled for 5.15 p.m., although in the event it was delayed first until 6.15 p.m. and then a little later. The 2nd Queens reached the south-western edge of the wood around 8 p.m., and shortly afterwards they were joined by the 1st South Staffordshires. This day was also one of the few where the cavalry were involved. Squadrons of the 20th Deccan Horse and the 7th Dragoon Guards waited for a while by Crucifix Corner, before advancing. They saw action, armed with weapons spanning the technology of centuries: lances and machine-guns were both used by the cavalry that day. The infantry advanced through the wood, but met increasing opposition, especially from a strong German line being prepared, known as the Switch Line, which ran through the northern apex of the wood. The British could not take this line, although they did hold around two-thirds of High Wood. 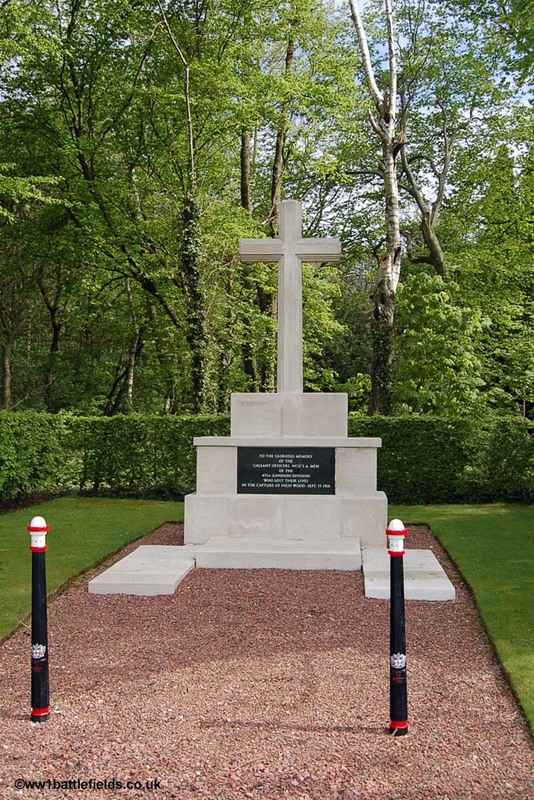 Reinforcements were sent up, including men from the 1/9 Highland Light Infantry (Glasgow Highlanders), and like many others over the next weeks and months, they also passed Crucifix Corner on their way up to High Wood. 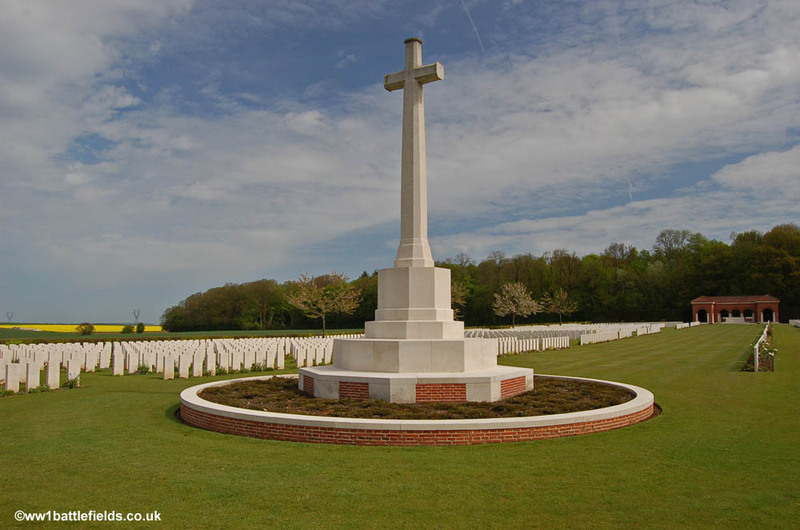 Crucifix Corner was the name given to several road or track junctions on the Western Front where there was a wayside crucifix, of the type that were and still are a common sight across France. 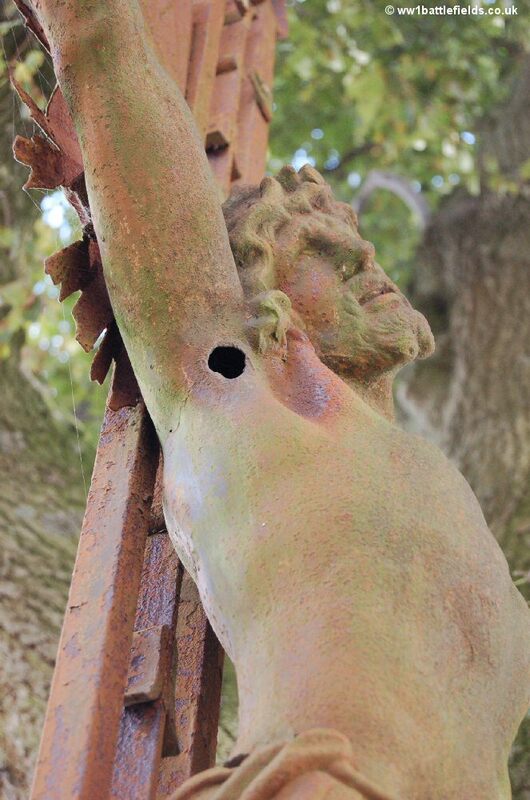 However, at the Crucifix Corner south of High Wood, the original crucifix can still be seen today – complete with holes and scars from damage sustained during the war nearly 90 years ago. 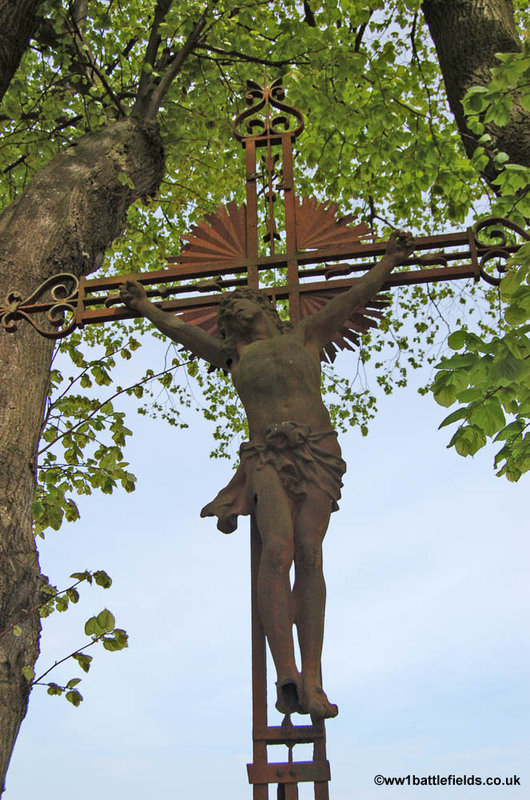 This Crucifix Corner, located where several tracks and roads intersect is just to the north of Bazentin-le-Grand. It was on the natural route up to the High Wood area for troops – which led through what became known as Death Valley, as, although safe from view, the Germans knew that it would be a natural transport route and shelled it mercilessly. At midnight on the 14th of July, the Germans counterattacked in High Wood, and the British could not hold on to it. The infantry attacks on the 14th had begun at 3.25 a.m., and met with success. Twenty-four hours later, fighting continued in High Wood, and except for the north-eastern corner the Germans held it again. The cavalry withdrew, at 3.40 a.m. on the 15th, and mounted cavalry were to play no further part in the Somme battles in 1916. The capture of High Wood was essential for further British attacks planned on the 15th of July, and by daylight further troops were thrown in, including the 16th Kings Royal Rifle Corps and the 2nd Worcesters. The fighting continued, but by evening on the 15th the Germans were still in control of High Wood, and were to remain so for a further two months. The attack on High Wood on the 20th of July was undertaken by, among other units, the 1st Cameronians, 5th Scottish Rifles and the 20th Royal Fusiliers. To the south-east of High Wood, leading towards Longueval, is a sunken track that can be walked today. This was known as Wood Lane, and a German trench located here was an important part of the front line as they held grimly onto High Wood. On the 20th of July, men of the 2nd Gordon Highlanders and 8th Devon’s attacked Wood Lane. The infantry crept as close as they could to the Wood and the German lines whilst the artillery bombardment raged, but when they advanced to attack they met with little success, in Wood Lane or in High Wood itself. Men did enter the wood, but German machine gun emplacements in several places within the wood caused losses. The Switch Line was another strongly held line from which the defenders resisted. Fighting continued, and by the time dawn broke the British held half of High Wood. The 2nd Gordon Highlanders and 8th Devon’s had to retire from Wood Lane however. When the Germans counterattacked from the west of the wood many troops retired, congregating at Crucifix Corner which being hidden from view from the German positions must have seemed safer. The 2nd Royal Welch Fusiliers were in reserve, and it was on their way up that Robert Graves was badly wounded. He was in fact reported as dead, and records the incidents fully in his autobiography, Goodbye to All That. At this time, the 2/RWF were near Bazentin churchyard, and as well as the major wounds, Graves also suffered a cut above his eye caused possibly by a chip of marble from one of the headstones there. The rest of the battalion marched up to High Wood. An observer who watched the Royal Welch Fusiliers enter the wood thought they were a “magnificent sight”. They fought well, and with the remnants of the other battalions overran the strongpoint in the western part of the wood, and took more or less the whole wood. However, they faced great opposition from the Switch Line outside the wood, and also urgently needed reinforcements that did not arrive. They and other troops held the wood for a few hours, but the Germans bombarded them and followed up with an infantry attack that retook the Switch Line within the wood, and the western part of the wood. The remaining troops were relieved at 1 a.m. on the 21st of July by the 1st Queens and 16th Kings Royal Rifle Corps. The wood had been taken, but not held, and the 2nd Royal Welch Fusiliers had suffered 249 casualties in the process. In The War the Infantry Knew (an account of the 2/RWF war experiences compiled by the battalions medical officer, Captain James Dunn), it is recorded that ‘every officer who took part in the attack was a casualty’. One of these was Second Lieutenant G R Heastey. His body was carried back by his platoon when they retired, and he is buried in Dantzig Alley Cemetery in Mametz. He is an exception – many of those who died in or near High Wood have no known grave. In his autobiography, Robert Graves related an account he had heard whilst recovering from his wounds that suggested that men from other battalions had not performed well in this battle. This included the 20th Royal Fusiliers, also known as the Public Schools Battalion, who in fact suffered higher losses that the Royal Welch, with 397 casualties. There was originally a timber cross erected by High Wood as a memorial to these men; it is no longer there, but in 1988 an oak tree was planted with a small plaque commemorating the 20th Royal Fusiliers at its base. This is at the edge of High Wood bordered by the Martinpuich road, walking right from the London Cemetery, and is easy to miss amongst the other trees. It is just before the 47th (London) Division memorial. After the 20th July attacks limped to their conclusions, the Germans reoccupied most of High Wood, until only the southern corner remained in British hands. They also dug a new defensive position, known as Intermediate trench, ahead of the Switch Line to the west of the wood. This meant that taking the wood, already almost within British hands twice only to slip away, became an even tougher proposition. Efforts however continued, and on the night of the 22nd/23rd of July, the 4th Gordon Highlanders attacked the eastern corner of the wood, whilst the 1st Royal West Kent’s attacked the south-eastern part of the wood and Wood Lane, there with the 14th Royal Warwickshire’s at their side. There had been a preliminary bombardment, but this had not inflicted sufficient loss on the defenders, and they were able to hold High Wood. No significant gains were made, although the Royal West Kent’s suffered 420 casualties. The other battalions also suffered losses. Units from the 51st Division fought here on the 23rd of July, and later a wooden cross was erected here to commemorate those of the 51st Division who had fallen. This cross still stands on the Somme today, but was moved to be near to the 51st Divisions imposing memorial near Beaumont Hamel, which is located within the Newfoundland Memorial Park. There was a gap of a week before the next attack was launched on the 30th of July. The Germans did not waste the time, aerial reconnaissance showing a build-up of troops and defences in High Wood and Wood Lane. The attack this time was made in the evening, and was preceded by a ‘creeping barrage’. Machine gun posts within High Wood had been a major factor in the losses inflicted on the British, and on this occasion there was a concerted artillery effort to destroy these. After the infantry attacked at 6.10 p.m., there was some success. Heavy artillery and smoke mortars helped troops of the 19th Division to take Intermediate Trench near High Wood. However, in the east of High Wood the machine guns there were able to thwart the 7th Black Watch. At Wood Lane, again there was no success. The 14th Royal Warwick’s followed up the initial attack, but were driven back. They suffered 171 casualties in the attack, less than some others – but the strength of the battalion before the attack was only 468. At the end of this last attack in July, there were few gains, and High Wood was still firmly in German hands. By this time the wood was largely destroyed, with shell-blasted tree stumps and churned up ground remaining – plus the dead of both sides. There had been large casualties for both the attackers and the defenders, and although there were a few minor actions over the next two weeks, there was no major set-piece attack (the Fourth Army were at this time concentrating on taking Guillemont). However, in early August, the British tried to move their lines closer to the wood. This was done firstly by sapping – digging small trenches out from the front line directly ahead, and then digging at 90 degrees to join these up and create a new front line trench ahead of the original one. More audaciously, as the Germans had done before, one night the British quietly left a section of their front line trench, moved carefully over No Man’s Land and rapidly dug another trench ahead of the original. By the morning they were safely within it, and closer to the German front line. Frank Richards in Old Soldiers Never Die describes the conditions in High Wood at about this time. Parts of the parapets of trenches contained the corpses of those killed in earlier attacks, and he describes heads, arms and legs sticking out. Because of the severe firing, the bodies of men killed had been used as shields by the survivors, and they had then been covered by earth to build up a parapet. Now, when shells landed near, during a very heavy bombardment which the 2nd Royal Welch Fusiliers endured, the dead were blown out of these parapets once more. Reading this, it is perhaps not surprising that so many killed in High Wood have no known grave. There were minor advances however – some more of Intermediate Trench to the west of High Wood was taken on the 11th of August, plus some of the Switch Line. In order to deal with the particularly troublesome machine-gun post on the east side of the wood, which could enfilade any advance on Wood Lane, a tunnel was started in early August with the intention of laying a mine under the machine-gun post. This was a long-term strategy, and the mines (there were to be two in the end) were blown several weeks later. 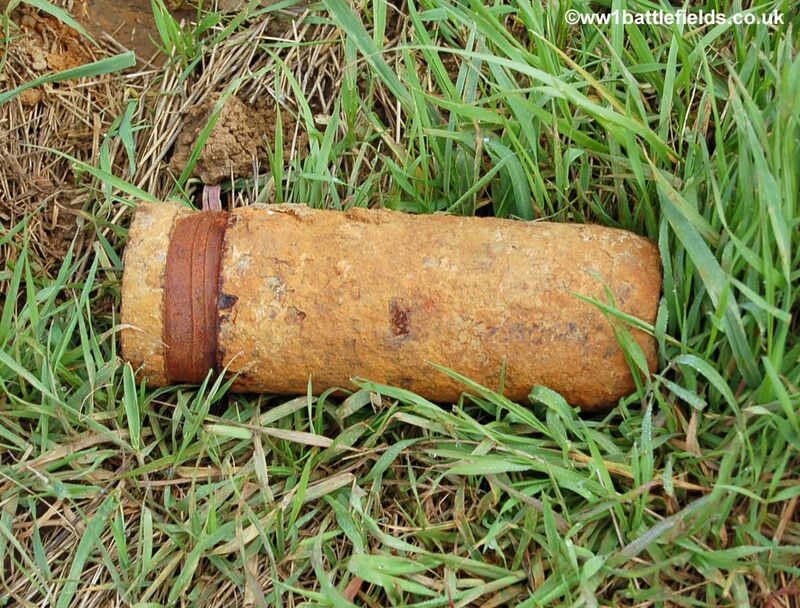 Other innovations were employed, including hydraulic devices known as ‘pipe-pushers’, which were to push tin canisters containing the explosive ammonal under the German trenches where they could be exploded, and also flamethrowers. These were not the portable weapons akin to the flammenwerfer which the Germans had used, notably at Hooge in 1915. Instead, the British versions were large (two ton) machines which had to be carried up in parts and then assembled in the front lines. Although both ‘pipe-pushers’ and flamethrowers were used, neither had any significant impact on the outcome at High Wood. Yet another innovation would later be used at High Wood – tanks – but this was to be a month later and also, here, to have little impact. Before that, yet another offensive on High Wood was planned by the British, conceived as part of a joint large-scale offensive with the French. This was to take place on the 18th of August. The 4th Kings Liverpool and 4th Suffolk’s were to attack Wood Lane. None of the former even reached Wood Lane, due to the German barrage and fire from the well-defended German positions. Some Suffolk’s did reach Wood Lane, but were forced out. In High Wood itself, the 2nd Argyll & Sutherland Highlanders attacked, but suffered from the British bombardment, which also damaged the flame-throwers, and the ‘pipe-pushers’ did not work as hoped. However the Highlanders advanced, and despite losses from machine-gun fire, some did reach the German trenches – but again could not hold on there. Over the next few days there were some skirmishes, and on the 24th of August a smoke screen and machine gun covering fire helped men of the 100th Brigade take trenches near Wood Lane. The covering machine gun fire was coordinated by then Captain G.S. Hutchison, who later wrote Pilgrimage, in which he also described his experiences during the 14th and 15th of July attacks on High Wood, as well as his return to the spot several years after the War. On the 3rd of September, a small offensive was planned to improve positions before a major attack which was to follow later in the month. There was no preliminary bombardment at High Wood because of the close proximity of the lines, but the attack commenced with the blowing of the mine beneath the machine-gun post in the east of High Wood. Since early August, the 178th Tunnelling Company had worked to dig down 25 feet, and then construct a gallery 310 feet long. They placed 3000 lbs of ammonal below the machine-gun position, and 30 seconds before the infantry attack the mine was blown. Troops of the 1st Black Watch rushed forwards and took possession of the crater. Again, ‘pipe-pushers’, flame-throwers and also flaming oil-drums were to be used in this attack, but they added little and again caused casualties to British troops in some cases. Meanwhile, troops of the 1st Cameronians and 8th Berkshires reached Wood Lane, where there had been a preliminary bombardment – their advance was made possible because the machine-gun position at the east of High Wood that was deadly to an attack on Wood Lane had been blown sky-high. They gained 200 yards of trench near High Wood in fierce hand to hand fighting. However, the attackers needed support to consolidate and hold their positions, and a German counter attack started, taking the crater in the east of High Wood and driving out the men of the Black Watch. The Germans then set up machine guns to replace those blown up by the mine, and so could enfilade Wood Lane once more. This in turn drove the Cameronians out of Wood Lane, and despite the innovations and even the mine, there was no success at High Wood. To commemorate the sacrifices of the 1st Cameronians and 1st Black Watch, these two units erected wooden crosses here in December 1916. These were replaced in 1924 by the first of the permanent memorials at the edge of High Wood. This memorial (pictured below) can be seen today half-way along the south-eastern edge of the wood. 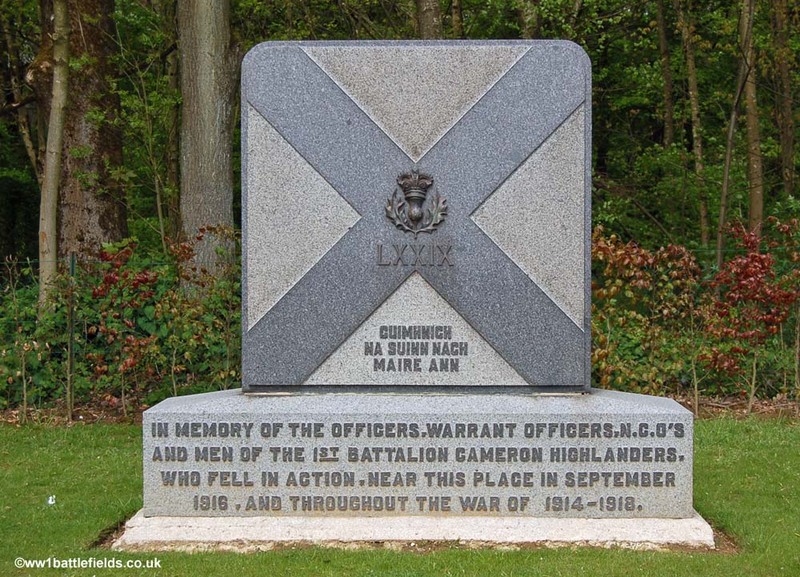 The wording at the base of the memorial is the same on both sides, except that the front commemorates the Cameron Highlanders whilst the rear commemorates the 1st Black Watch. In the centre of the cross on either side is the insignia and below this the motto. It was now definitely planned to use tanks in a large attack on the 15th of September, but before that there was to be another drive to improve the British position at High Wood. On the 8th of September, the 1st Gloucester’s and the 2nd Welsh Regiment attacked the west side of High Wood, but suffered badly, especially the Gloucester’s. 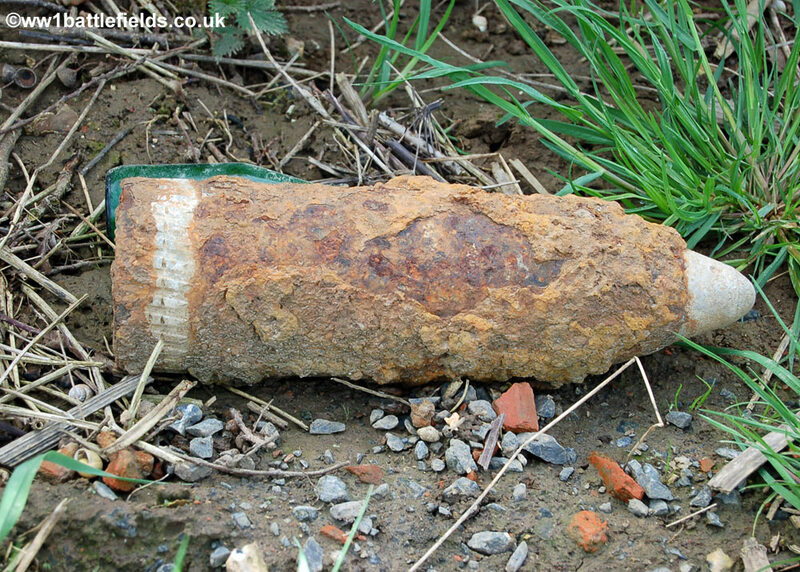 On the east side, the machine-gun in the crater blown on the 3rd of September still prevented progress near Wood Lane. The tunnellers thus placed another 3000 lbs of ammonal below the crater’s edge, and this second mine was blown 30 seconds before the infantry attack. Once again, however, although the crater was briefly held, the Germans soon overran it again. The infantry assaulting here had suffered from their own barrage as they went up to the line, and although men of the 2nd Royal Sussex and the 2nd Kings Royal Rifle Corps did capture Wood lane to the south-east of High Wood, there was little success in the wood itself. The double crater formed by the mines blown on the 3rd and 9th of September can still be seen today, in the eastern corner of High Wood shortly before the track running round the wood turns to the west. As a double crater it measured 135 by 185 feet, and was 35 feet deep. Today it is water filled, unlike other craters in the Somme area, and was blown by two charges of 3,000 lbs of ammmonal each. For comparison, the large crater at Lochnagar was created by a mine containing 60,000 lbs of ammonal. Wood Lane had however been captured, and elsewhere there was success also at Ginchy, and the British finally took the last part of Delville Wood. But the intention of the 9th of September attack, to obtain a better starting position for the large-scale offensive on the 15th, had not really been met. The attack on the wider front was preceded by a three day artillery bombardment, but at High Wood the opposing front lines were considered too close together for this to be done. Four tanks were to lead the infantry advance at High Wood, and the principal attacking force was to be the 47th (London) Division, part of III Corps. On their right were the New Zealand Division, and on their left the 50th Division. Barter and his brigade commanders were unhappy with the plan of attack proposed, and wanted to change it. They felt (and proved to be right) that tanks would not be able to operate in the mass of tree stumps and craters that High Wood had become. They also wanted to withdraw their troops temporarily from the front line to allow a bombardment of the German positions before the attack. However III Corps Headquarters refused these changes, and so Barter had to go ahead with the original plan. The infantry attack on the wood was made by the London Irish (18th London’s), Poplar & Stepney Rifles (17th London’s) and two companies of the 15th London’s (Civil Service Rifles). They suffered from enemy machine-gun fire as, just before zero, they lay in No Man’s Land ahead of their trenches. The German artillery also opened up. After the assault commenced, 80% of the Civil Service Rifles became casualties, with two Company Commanders killed, Captains Arthur Roberts and Leslie Davies. Roberts had crawled close to the German trenches and was shot dead as he gave the order to charge. His body was found only after the War and he is now buried in Cerisy-Gailly French National Cemetery south-west of Albert. The survivors from the London troops got back to their trenches, and two more battalions, the 19th and 20th London’s were sent up in support. On the left of High Wood, troops trying to advance were caught by machine gun fire from the west of High Wood. The 7th London’s on the right, however, advanced to and took the Switch Line. In the Wood, the Post Office Rifles (8th London’s) followed up the attack of their fellow Londoners, and suffered losses from withering machine gun fire. They did however manage to reach the German trenches. The 6th London’s followed on at 8.20 a.m.
By 1 p.m. on the 15th of September, the British finally held High Wood, and it had been taken, after all the attempts described above, by the 47th (London) Division. But success came at a price. The Poplar & Stepney Rifles (17th London’s) suffered 332 casualties, and the other battalions involved had suffered serious losses as well. On the 19th of September, the 47th Division which had lost more than 4,500 men was relieved by the 1st Division. At an hours’ notice, Major-General Barter, commanding the 47th Division, was dismissed by the III Corps Commander, Pulteney, for wastage of men. Barter protested his innocence; after all he had wanted to withdraw and bombard the wood, but this had been refused. After losses had been suffered, a bombardment had finally been sanctioned, and the wood was then taken. Although there was never an official inquiry, Charles Barter was later knighted.